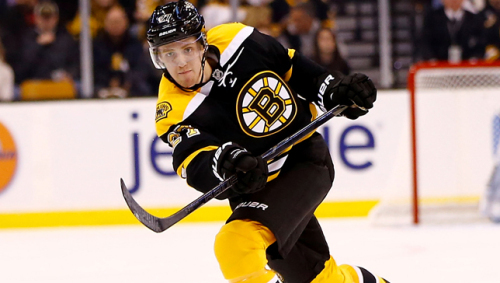 When it comes to trivia on the B’s players, fans across the state have no problem spouting off anything from their jersey number and draft pick year to their exact height, weight, and number of goals over the past five seasons. It’s common knowledge, let’s be real here. But how well do we truly know the Bruins? And no, I don’t mean their results from training camp, nor their exact weight in pounds and ounces the day they were born. More along the lines of… what’s their favorite color? Or maybe their favorite Indiana Jones movie? Or even the sandwich they always get at Subway. These are the questions that truly need answering. Before I go any further, let me make a quick PSA: Hockey players love the word “um”. For Lord Stanley’s sake I’ve heard it well over twenty times in the past week. Too many pucks to the head maybe but I digress. First in the hot seat: Dougie Hamilton. Saturday night on October 11th I managed to sneak in a few minutes with our favorite red-haired defensemen about a few things fans have asked to know before he went to eat his away his feelings with Quaider’s gourmet grilled cheese sandwiches and binge watch Netflix until he passed out – I’m assuming. A: He gave us a tiny smirk and shook his head, probably wondering what the hell we were talking about. Um… laughs a clown. Q: Alright, alright. I can see it. What was your favorite Christmas present? A: UmmmMacBook. Yes, the two words were combined exactly like this as he said them. Don’t ask me. Q: Go-to song to sing in the shower? A: He. Barely. Hesitated. Um… “Story of My Life”. YES. THE ONE DIRECTION SONG. Take a moment and imagine if you will 6’3” Dougie Hamilton who eats other hockey players for breakfast completely rocking out to this godforsaken song and making a Mohawk with shampoo suds with one hand and using an Axe body wash bottle in the other as a microphone. Blows my mind. Q: Favorite TV guilty pleasure? A: TSN back home in Canada. For those of you who don’t know, TSN is The Sports Network. How original. We were hoping for something more along the lines of The Vampire Diaries or The Bachelor or even Pretty Little Liars. Dougie seems like a Pretty Little Liars kind of guy. Q: Alright, last one. Favorite breakfast food? A: He really had to think about this one. Bagel with… cheese. Cheese. All he said… was cheese. What kind of cheese, Dougie? Cream cheese? Pepper jack? Bleu cheese? The questions I still have.